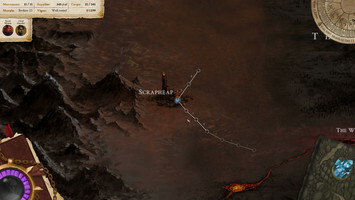 Movement on the world map is turned-based. Players start their turns (one turn equals a day in-game) with a number of available Movement Points. Players always stand on nodes, and can move between them (on the paths) by spending Movement Points. Based on the terrain, the road (if any), and weather conditions, as well as the distance of the next node, the cost of movement between nodes can be markedly different. You can see this represented by the little numbers next to each line on the video. 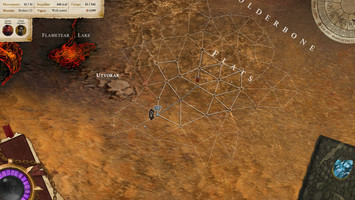 As the available Movement Points are spent, the possibilities of the routes taken are narrowed down and that is represented by the nodes and lines fading away in the areas now unavailable for the caravan to move into. 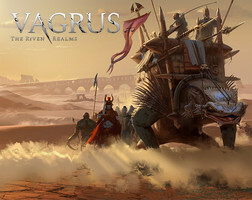 When the caravan runs out of Movement Points, it is unwilling to push on that given turn, and needs to Camp on the node it currently occupies. Camping refreshes Movement Points (and also has a lot of other functions, but more on those in a future post!). Movement Points are displayed on the top left UI. March movement points (available as bonus and calculated from normal Movement Points) are displayed in red behind normal Movement Points. There's the option to March, indicated by the red target node and path, which occurs when a caravan opts to move beyond its available Movement Points in a given turn. Marching decreases Morale and Vigor but could buy you time. Movement Point costs are displayed either in blue (normal movement MP cost), red (the additional cost of Marching), and grey (which only serves to help you calculate longer journeys, as these nodes are not reachable in the current turn, not even by Marching). We hope you liked this update, first of many to follow! Feel free to pose questions, add comments, and follow us here or on any other social media channel.